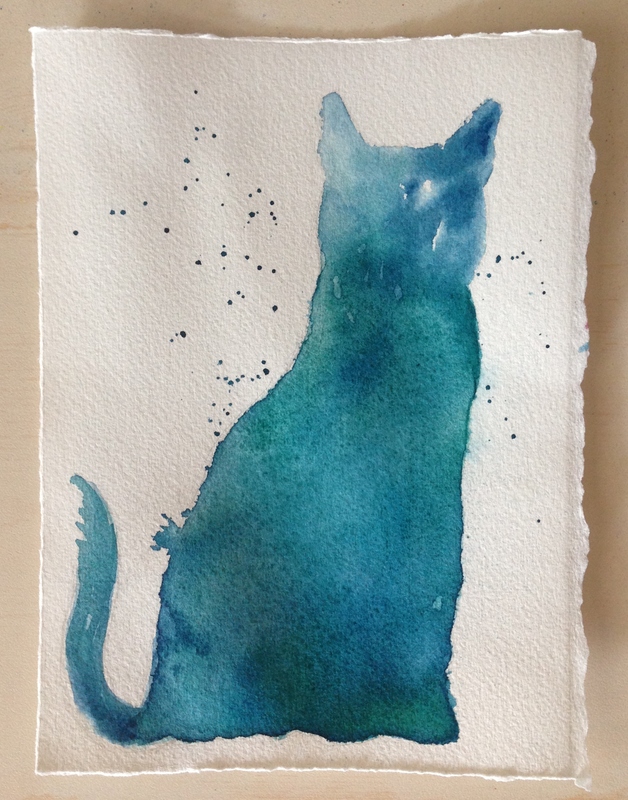 So last night, I had some fun with a silhouette of a cat, which I lightly drew with a 5H pencil, damp paper, my watercolor palette…and some splatter. Splatter seems to make everything better! Thought for the Day: Purr more. Meow less. What makes you feel like purring? Do more of it; make time for yourself. Make the world a better place, one soul at a time. Remember the ripples. Peace. Lol they do love a good play. 🙂 I’m still working on it, Carrie, it’s a work in process really, and I take pictures in stages so if I go too far I can post the one before I overdid it. This one didn’t turn out the way I envisioned it, but watercolor pretty much never does for me. I think it’s part of the beauty of it because sometimes it turns out even better! It helps when I sit down in a good mood to watercolor. If I’m tense, I feel like people can see it in my work. Do you feel that way too? Your waffle is seriously great!! Aww maraming salamat! (thank you). 🙂 Hubby just got home and we did a high five. He loved it! Thanks, Kerfe! I was thinking of your kitty friend and my sweet girl, been almost a year now. Boy, they capture our hearts, don’t they? They sure do. I’m still looking out the window for him. Your kitty was purrrrrrfect today. Just what I needed it. Your words meant even more as Kevin is having a difficult time in Louisville. Please keep him in your prayers. Yes! I’m trying to find the balance. This one went too far and glad I took photos in stages lol. You=splatter in my head, Jodi. I had fun! I will do more 🎨😎🌻🙀 So glad you like! No doubt! Overdid the splatter. It’s too much fun! Totally did. Thank you for remembering her. KFMR? I think your comment said this so I was asking what you meant? LOL! Nono, your comment way up there^^^^ it was autocorrect I think? Thanks, Sharon! It was fun. I love fun! It is a cat Laura. How inappropriate! Crud, I just let out a little bitty woof. Aw thanks, Squid! That’s a dynamite pic of you, by the way! I’m so glad you enjoyed this, Melissa, and I hope you do, soon, I’m sure I’d love it! I like your thought for the day! And the kitty! I great day of sewing makes me purr. Yes. I understand totally Tierney! Love your cat! Especially that blue. I agree splatters are too much fun.! You’re making magic this month, Lucy! Awww you’ve had some bad experiences. Cats usually only do those things when they’re afraid. Sometimes dogs will freak them out. I love drawing dogs! What kind of dog do you have, Patsy? I do know, Amy, and there is nothing like it! I really admire Debi’s work too. I’m really glad you like my kitty! She was fun to make. It’s so nice whenever we stay in the present moment. Art really helps us do that, I think. Right?! Well in my case the art supply shopping bit is a bit troubling lol but overall I’m conquering that. Yes, much rather but art supplies than beer, cigs, or for that matter, nail polish. Lol!! A purrrfectly lovely post Laura! The colors danced divinely. Always a happy ending a bonus!! Slow recovery, trying to catch up on all my friends blog postings. Purr-fect Laura. Looks great and love the color. You’re right about spatters, they everything more interesting. Playing with my artsy stuff makes me want to purr all day long!!! Thank you so much, Aditi! I’d like to do more of these! Love it, love the splatters, love the thought for the day. This one rocks my world Laura, thanks! Beautiful silhouette, love watching paint dance and mingle. Thank you for sharing the fun! Thanks for taking a look, Haunani! It was lots of fun! purring, purring…. very precioussss 🙂 I like how the ‘inside’ of the cat is drawing us, In. looking at all those textures the paint and paper created. so yummy. purfect teal tail. God this is beautiful. I’ve painted with acrylics all my life, but there’s just something so… serene about watercolors. They seem so deliciously unpredictable to work with. At least, if you are a lover of impressionism and the like. It’s almost like they have a true life of their own! They really do. Thanks so much for your kind comment! Really glad you enjoyed it!